He started writing with poems but his original place in fiction writing. Smaranjit wrote excellent both stories and novel. He is successful in different types of writing. In addition to the story of love or relationship, he also wrote detective, ghost, thriller, teenage literature. 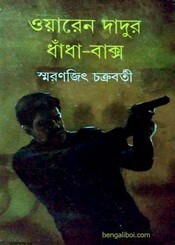 Undoubtedly this author has created a new language in Bengali literature. He is very popular among the youth readers. Now I want to share a book of this famous and modern author- 'Waren Dadur Dhandha Baxo'. there are three stories in this book. The ebook pdf has 168 pages, 23 mb file size.